Having had the pleasure of serving as a Wedding Entertainment Director® in Virginia since 2008, I have seen a lot of wedding ceremony and wedding reception venues around the Fredericksburg area (my home). Here is a wrap up of some of venues in the area with some notes. Hopefully, this will help you decide which venue is right for your wedding reception. NOTE: By no means is this an end-all, be-all list of venues. These are venues that I have worked at several times, and have built relationships with the directors. All of these wedding reception venues are located within a 30 minute radius of downtown Fredericksburg. Stevenson Ridge – One of my favorites, Stevenson Ridge features a beautiful location for an outdoor ceremony in front of the pond which is home to many geese in the summer. For larger wedding receptions, The Lodge presents great rustic colors and plenty of room for personality and a unique look. Your guests will walk in through doors from the home of Union General Ulysses S. Grant and be immersed in history. Morais Vineyards – Morais Vineyards is probably the largest venue on this list boasting enough room easy for 200+ guests. The gorgeous surroundings, in house wine, rolling vineyards and Spanish style villa provides a great scenic backdrop for your wedding. You’ll forget you are Bealeton, Virginia and think Barcelona. Gari Melcher’s Home and Studio at Belmont – The home and studio of the famous local artist, Gari Melcher, provides an outdoor ceremony that is perfect for quaint, picture perfect moments. The indoor reception features large windows to the outside and an intimate location for small weddings with the unique artistic flavor. Jepson Alumni Executive Center at the University of Mary Washington – Located on the campus of the University of Mary Washington, the Jepson offers a large ballroom that changes with up lighting and large dance floor that will hold all your guests. Ceremonies can be held outdoors under the tree or inside when the weather is iffy. A great choice for many weddings. The Inn at Kelly’s Ford – Gorgeous outdoor environment featuring a horse ranch and rolling hills; ceremony site can include either tucked-away locale surrounded by trees or beautiful fountain centerpiece. Smaller wedding receptions are held in the picturesque Ripley Hall while large scale weddings are held in the barn which can hold hundreds of guests. The Kenmore Inn – Another small, quaint, historic inn located in heart of downtown Fredericksburg, Kenmore offers some great food and very good service. The front entrance offers a unique wedding ceremony where everyone on Princess Anne Street can see. For most receptions, you’ll be in the basement which features a good size dance area, a pretty landscaped brick patio, and a full bar. 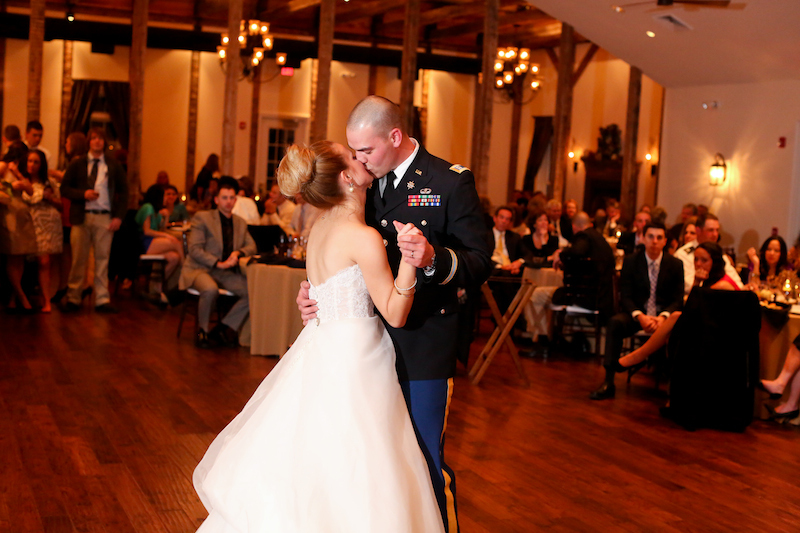 Smaller receptions are held upstairs with a dance floor, bar, and four rooms dedicated to your wedding. The Inn at the Old Silk Mill – One of the more recent additions to the Fredericksburg wedding venue list, this renovated silk mill is totally unique in its feel. Located along the river in the heart of downtown, the Inn at the Old Silk Mill is large enough for most weddings, can be personalized for many themes, and can help to create lasting memories for any wedding. Eden Try Estate and Manor House – A fun location along River Road in Fredericksburg, Eden Try has some features you won’t see anywhere: A Garden of Eden, ancient trees, cascading fountains, and a brand new facility for hosting large weddings. You might fall in love with this location. Riverside Weddings by Clore Brothers – Talk about unique! Here’s a wedding ceremony and reception venue that is directly on the riverbank. A working facility that daily offers canoe and fishing opportunities, this site is all about the rustic outdoors. SECOND NOTE: This list is due to change and update as I work in newer venues or those I have yet to see. Know a venue that is missing from this list? Have any great memories from the venues on the list you’d like to share? Use the comments section below. I would love to hear about it. Eric Herod Entertainment shared a post. We are bringing it with Ava Laurenne Bride and Luminuss Productions again! See you Sunday! Latest mix of a little bit of everything. I was jamming out in my new almost finished basement sound studio. Erock mixes live with a little bit of everything. True love celebrated at every wedding. Laughter is one of our main goals for every wedding. Then after the booth, we collaborated even further with Ava Laurenne Bride, Luminuss Productions, and Salon Voss on a phenomenal Fashion Show featuring a little glimpse of Katie and Brad’s Love Story. What a collaboration of expertise, creativity, and passion at our bridal show booth today at the The Big Day - Bridal Show. Ava Laurenne Bride, Luminuss Productions, a new designer in the area who we will feature in a few days, and some of our own legendary wedding specialists. Talk about a red carpet experience for brides, grooms, and their friends and families! Find out the 3 Secrets Your DJ Won’t Tell You!